Using re-purposed furnishings in harmony with modern German design techniques is a testament to the ingenuity and practical thinking that is evident in day to day Berlin life. We guarantee comfy beds, clean washrooms, and a tranquil and respectful environment. Most of all we offer extremely personable and helpful service from life long Berliners. Whether you are visiting Berlin for work, inspiration, vacation or simply to sight-see and relax, Viertelvier can accommodate every need you are likely to have. Central, convenient location without the noise. We offer a personal, cozy atmosphere in an exciting city, clean and incredibly spacious rooms, immaculate bathrooms, only the most comfy beds for a good night sleep, friendly staff helps you plan the best route and find the best bars and Wi-Fi internet access. Looking for more privacy? Small groups are also welcome at Viertelvier. Once you made a booking, you need to CONFIRM YOUR ARRIVAL TIME by email! If you do not send us an email 24 hours before the arrival date, you run the risk that your booking will be cancelled. We have an age restriction for the dormitory (18-35 yrs.). In case of doubt please get in touch with us prior to your booking. Cancellation charge up to 2 full nights (of the booked bed price) in case of failure to confirm or no-show. Bed linen: 3 EUR per person. Please be advised that everyone who plans to arrive after 2 p.m. has to email us before the arrival day to arrange the late check-in. Then you will get your personal check-in information via email. Otherwise your reservation will be cancelled at 24h 1 day before arrival day. Once you have checked-in, you will get your own key for a 24 hour access. From 10.30 you can leave your luggage with us. 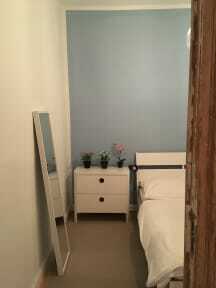 Great place to stay, private and quiet with multiple train stations only a few minutes walk away. 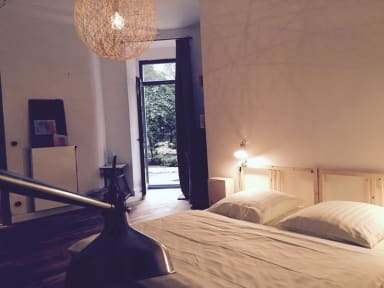 Would highly recommend to anyone looking to make their stay in Berlin even more memorable. Viertelvier was excellent and I would definitely stay again. Location is great, the facilities clean and comfortable, and the owners very friendly and helpful. The hostel is in an apartment building with one 6 bed dorm and a 2 bed room. Not your typical cramped hostel dorm (roomy and nice lighting) which was super refreshing, but if you're solo and are wanting to meet a whole lot of new people it could be hit or miss depending who's there.. although I did meet some awesome people on my visit! Overall I must it was quite a homey feeling the minute i stepped in, great hospitality and generosity from enrico ! will be back soon ! This is definitely one of the best Hostels I've stayed at in Europe! Super clean and spacious, and the dorms are not your typical dorms. You really feel like you're at home here. Max met me when I checked in and told me alllll the good spots to eat and drink and he was always available if we needed. The area is also perfect, really close to bars, cafes and public transport. We will absolutely stay here whenever in Berlin. Thanks! The guys at Viertelvier were great. They were really welcoming and helpful and provided some great info to get me orientated with the city. The hostel is well kept and comfortable. I had a great stay thanks to Enrico and Max and their hospitality. Would highly recommend. Great hosts, amazing location, feels like home! Noice place. Berlin even more so. Would stay again. Highly recommended, stayed 4 nights in 6 bed dorm. Close to U7/8, Lidl and Aldi. Great area. Enrico was great - gave me lots of advice, unfortunately didn't meet Max. I met some great people who i'll stay in touch with. Communal area was a small kitchen, sufficient but not the most comfortable. Bed's were cool and very personal with lights / sockets, however my frame was covered in hair and dust - otherwise everything else was perfect. Good Wifi. Shared and communal bathrooms.